Please click the right icon to download the lessons. Use this code - website2 - for your free trial. To register and use the Thor reading lessons (currently for Android devices only), please see the notes below. Learners who have not yet registered for Thor will need to do so with help from their teacher. One registers for the first time by using the Android device or computer or laptop, to open the Chrome browser. Then visit thor.ttinet.com, and clicking "Register for Free." *See image R below. Then the learner will be asked to enter an email address, password, first name and last name. The teacher must register each student with the student’s email address, or with a made-up address. This could be the student’s first name, and last name, @thor.com. Here is an example: sugata.mitra@thor.com. If it says that the email is in use, then please add a “2” to the end, such as: sugata.mitra2@thor.com; or a birthday such as 615. *See image S below. For ease of logging in, we suggest that the password for all tablets be the word, “password”. Also, the learner will need to select the right age level and role. Next the learner will type in the postal code and country code. Lastly, the learner will type in this access code: website2 and click “Register” on the bottom. *See image T below. After that, the learner will be asked to log in using the registered email and password. *See image U below. Now the learner is ready to use Thor. A three minute video will show you "How Thor Lessons Work" - in the next section. Reading is the most important skill - Every subject is easier for those who read well. English is the language of business, and science, and government - all over the world. Today almost anyone can learn almost anything on mobile - for free! But they must read English. Please see the chart below. 1. Thor works best on Android devices, using the most recent version of Chrome as the browser. Apple and other devices, and Safari or other browsers, produce confusing results. If using a cell phone or a tablet with the Android operating system, Thor can be downloaded as an application onto the device from this link. If the teacher (or parent or coach who is acting as a teacher) needs to check that the device is using the Chrome browser, please look for the Chrome icon on the device's screen. For more information, please go to Google support or email us at support@learnonmobile.com. 2. The learner must know how to use the keyboard on the device’s screen. Also, the learner should know where some of the most common letters are. Please see “Keyboard Practice” below. 3. Learners who have not yet registered for Thor will need to do so with help from their teacher. Please see “How to register a new user,” below. 4. For new learners, detailed vocal instructions must be given by the teacher on how to use the lessons. “Well begun is half done!” Please see “How Thor Lessons Work,” below. The teacher must also check each learner's progress closely during the first five lessons. This is to ensure that the learner fully understands how the lessons work. Also, the teacher should make sure that the learner moves to lessons 6 - 10 successfully. The keyboard image below highlights the 14 most commonly used letters in the English language. The vowels are highlighted in pink. The shift key to get capital letters is not needed, nor is the space bar. Practice finding the letters A, M, N, R and D, will be very helpful. These are the first five letters in our lessons. Teachers should spend some time in the beginning, helping learners become familiar with these 14 letters. This will make the lessons easier and more fun! Thor was built and refined over many years. However, internet connections vary. Also, some students may press the screen in some unexpected way. In case of any difficulty, please email a screenshot to support@learnonmobile.com. Here is a link to a three minute video, which shows how the screen looks, as the learner taps the letters. Please watch this easy introduction. To start, the learner taps the green arrow image on the Dashboard page. The five lessons in the first step will be shown as green buttons. The learner taps Lesson 1 to work on it. *See image 3 below. 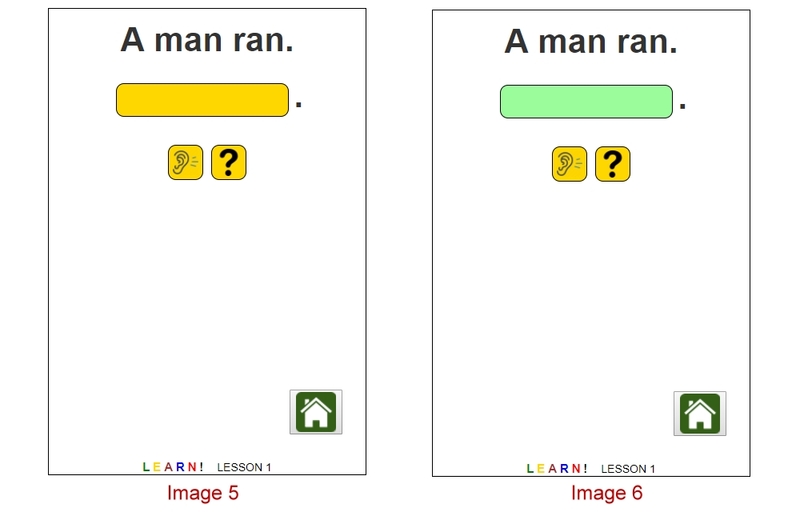 The next screen displays “A Basic Phonics Lesson for Beginning Readers” with a rocket image. The learner taps the rocket to begin. *See image 4 below. Thor’s voice then speaks to the learner. It says what to do, for example, “Type this sentence”. Then the voice clearly says the sentence (or word). The learner then follows these instructions by tapping the letters on the screen's keyboard. Note: the learner must wait for the voice to stop talking, and only then type on the screen. When Thor's voice stops talking, the gold color will turn to green. This allows the typing to begin. *See images 5 and 6 below. Thor will not allow the learner to enter a wrong letter. If wrong letter is tapped, the screen turns red. Thor says “Please try again.” Mastery learning starts here. Thor uses the same “mastery learning” as Khan Academy. Each letter must be tapped correctly, before the next can be tapped. Also, each of the lessons must be finished correctly, before the next one is started. *See image 7 below. If the learner gets stuck on an answer, there is a “?” on the screen that can be tapped. Thor will then show the answer to the learner. However, the learner will still have to type the right letter. This helps the learning process. There is also an image of an ear beside the “?”. Tapping the ear will cause Thor to repeat the word or sentence out loud. *See image 8 above. When each part of the lesson is finished, the rocket will appear. The learner taps this to continue. When the entire lesson is successfully completed, some fun short movie clip will appear. *See image 9 below. To begin the next lesson, the learner taps on the “Home” button in the bottom right corner of the screen (a house icon image.) This will display the group of lessons or tests that the learner was working on. Now the completed lessons have a gray background. The learner taps on the next lesson to start again. *See image 10 above. The learner or teacher can see recent progress very easily. Below is an image of a Progress Chart. The learner can tap Progress at any time, and see the progress being made. Each Step includes five lessons. The Thor reading system is based on a lifetime of work by master educator Thorwald Esbensen. He identified the central cause of illiteracy as the inability to decode letters into words, and words into sounds. Thorwald taught at all grade levels, from kindergarten through university graduate school, before becoming the curriculum director for the city of Duluth, Minnesota. He spent ten years, building and refining the Thor lessons. Word decoding should be separated from word comprehension. If you can spell it, you can read it. Most English words can be sounded out correctly, from the letters. These words are taught first, in our phonics lessons. The phonics lessons enable the learner to master the “usual” sound of each letter. Learners gain confidence from learning the rules, which are usually reliable. In later lessons, learners learn the exceptions to the rules. But most important words sound as their phonics would suggest. The lessons within each series are divided into groups of five, e.g., lessons 1-5, 6-10, etc. Each lesson includes ten words, and each word has approximately five letters. Each group of five lessons emphasizes one or more letter patterns. These include the beginning consonant blend “sn,” as in “snap” – or the ending consonant blend “1p,” as in “help.” The learner always works with complete sentences. The sentences build slowly on these letter patterns. There are more than 1,000 sentences in the phonics program. Each learner works with all of them. The words "a" and "the" are the only words in the whole phonics program that do not have the "regular" sounds of the other letter patterns. The word "a" appears in Lesson 1. The word "the" is first used in Lesson 221. Please note: The most important point of teaching phonics is to help learners acquire the skills needed to decode English letters instantly. Odd sentences – such as “Can a big pig jig?” are frequently used to serve this purpose. Other words used in the program that are not usually given to beginning readers offer extra vocabulary development. For example, small words such as "nab" and "gab" fit nicely into a phonics approach to instruction.